A romance that blossomed in Hanoi might now make food lovers in Kuala Lumpur strike up an affair with Vietnamese fare, home-cooked with the sort of passion that's the province of the tastiest private kitchens. Cute Ball Kitchen is the brainchild of Malaysian K.K. Teoh & his Vietnamese wife, Hoa, who met while Teoh was working in Vietnam's capital. Teoh returned in 2013, bringing home Hoa & their now three-year-old son, whose Vietnamese-language family nickname forms the basis for their new private kitchen's name. Many thanks to the friendly couple for inviting us into their Petaling Jaya home for some of the most satisfying Vietnamese food we've ever enjoyed, welcoming us warmly with herb-dusted fritters that whet the appetite wonderfully. 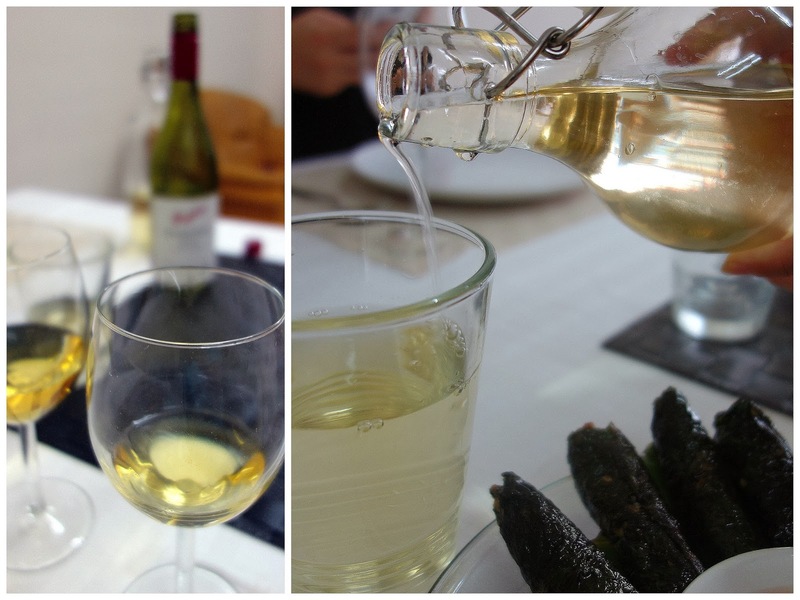 Hoa is likely to prepare communal meals of three to four dishes for guests. Her repertoire includes grilled seasoned pork, juicy, aromatic & savoury, wrapped in wild betel leaves that the couple pick themselves from a nearby hill, braving mosquitoes there to procure these peppery pleasures. Hoa's Vietnamese salad scores top marks, light & exceptionally easy to gobble up, wholesome-tasting & ravishingly nuanced with fresh veggies, seafood, meat, herbs & nuts. Like everything here, it's painstakingly prepared, with nearly a full day's worth of slaving in the kitchen to whip up courses like this. Braised pork belly, sumptuously caramelized. Bring a nice Merlot to savor with this; in a cost-effective contrast to eating out at a restaurant, there's no corkage fee here. Salt-&-pepper squid. Hoa's standards for seafood are high, the result of many years spent at Halong Bay; the couple now regularly drive to Sekinchan on weekends to secure straight-off-the-boat seafood _ an effort for which guests will be grateful. Steamed rice is thoughtfully sourced too, coming from a paddy processing plant amid Sekinchan's rice fields. With Vietnam having a strong French connection, it's not improper _ but nevertheless a pleasant surprise _ that Hoa opts for French sweets to wrap up her meals. Freshly baked madeleines are an uncommon treat, but what really won everyone over was the heavenly dark chocolate tart, thick & creamy, rich in flavour. All in all, this feels like a lovely way to spend a casual Saturday evening, the only time Kenneth & Hoa currently operate their private kitchen. The couple have hopes of eventually starting their own cafe (we vote, "yes, please!") & are currently open to also supplying cafes with baked goodies (the dark choc tart would be a sure-fire hit, much more delicious than the norm). The latest edition of Eat Drink KL: 100 Favorites for January-March 2014 is now available online, featuring 100 pretty nice eateries, including more than 20 new entries for this quarter. The eBook can be read & downloaded for free, convenient reading on computers, tablets & smartphones. Please click here: http://eatdrinkkl.publ.com/Eat-Drink-KL-100-Favorites-Jan-March-2014 (This link expires April 1, 2014; see blog entries after that date for new link). 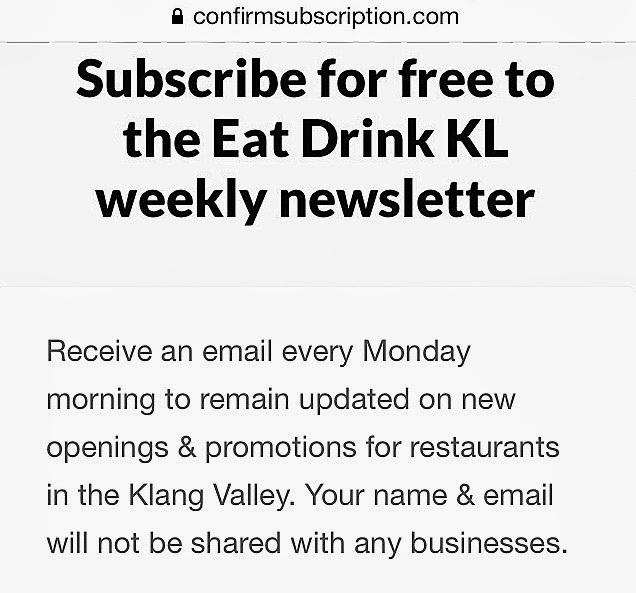 Beginning late January, a free email newsletter will be sent out every Monday to subscribers, highlighting new restaurant openings (even before they're featured on this blog), F&B promotions & other tasty tidbits for the Klang Valley. Thanks very much; subscriptions are appreciated. Yum! Everything looks good! :D I love Vietnamese food and KL isn't exactly blessed with Vietnamese immigrants like Oz is. Food is beautifully presented and the decor is very attractive and fresh. I love that rock fountain! What a cute name! Looks like a lovely couple and their cute lil boy :-) Love Vietnamese food - hope they'll open that cafe soon! Ulric: we finished every spoonful of both of those, cos they were yummy indeed! 小乱: If you would like to sample our salad, please come join us for dinner. We will make sure to prepare an extra large serving of salad for you! probably the first underground kitchen in Malaysia! Lovely Vietnamese food.... all looks very well prepared! Suituapui: you'll have to fight me for the last piece! Thank you Sean for your awesome review! We are absolutely ecstatic with your very kind feedback. We hope to see you again at Cute Ball Kitchen soon, especially after Chinese New Year when we will be bringing back hard-to-find ingredients from Vietnam for our dinners. Very fair price!!! Will love to check them out soon! Missy, lets ! Looks good ya..
Yay for home based food business! Don't you just love their passion for good food? Cute Ball Kitchen kinda reminded me of how we started 3 years ago ;) I can't eat their food as I can't consume pork but dammit, they look good! Wish them all the best in their culinary journey!